Go ahead. Somebody… anybody… I dare you to say Tom Brady doesn’t read LobShots. Dare. You. I’m not here trying to say that the only reason Tom Brady shattered his career high in passing yardage on MNF is because of me… but the only reason Tom Brady shattered his career high in passing yardage is because of me. From earlier today, in reference to Cam Newton’s big rookie debut, I said, and I quote, “Oh, and the golden boy of all quarterbacks, Tom Brady… has never thrown for 422 yards. (He’s only gone over 400 yards in a game once, for 410 in 2002. )” Yep, direct quote. 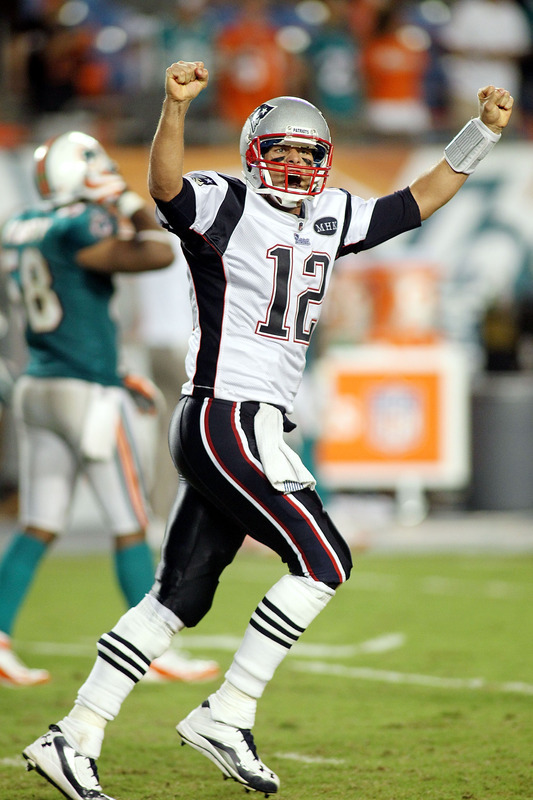 All of the above that I wrote… that’s how I felt watching Tom Brady against the Dolphins for the 2011 MNF season opener. Dude is just good, and resilient. It’s friggin’ impressive. Impressive to point of bothersome. Well, Tom Brady… glad you’re a LobShots reader, and you’re welcome for some inspiration for the game. You just keep doing those Uggs ads, and that should provide me with plenty of ammo to mock you, thus providing you with motivation to win… at least until you play the Bolts. Cheers. Tell Giselle that BP said waddup. This entry was posted in Football, NFL and tagged dolphins, Giselle Bundchen, NFL, passing record, Patriots, The Brady Six, Tom Brady. Bookmark the permalink.